A record nine entries in the 2019 Rose Parade earned California Grown Certification – a distinction that recognizes entries decorated with over 85 percent of cut flowers and greens from the Golden State. 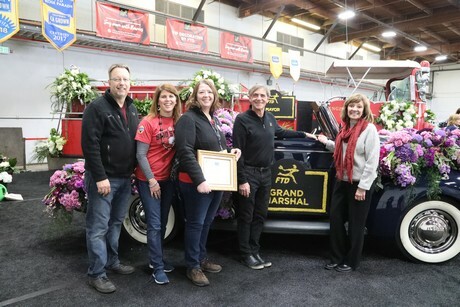 From left to right: Peter Samek, Trish Duggan, Janet Justus stand alongside Keith White, lead designer for all of the stunning FTD vehicles in the parade and Secretary Karen Ross. Photo by Linda Blue Photography. It was a full-circle moment for the event that was originally created to showcase the bounty of what’s growing in California when much of the country is snowbound. Blooms and foliage from California flower farmers dazzled the crowd on float, equestrian, motorcycle and car entries. Here’s a look at each of the California Grown parade entries and the flowers and foliage that adorned them.